Internal reserves are among the most enduringly rewarding urban phenomena. There are few things as uplifting as green space ringed by houses, free from the pervasive disturbances of cars. The suburb of Killara is blessed with two classic examples that conform to the house-locked variety which aficionados tend to crave. Both are easy to miss unless you’re armed with a smartphone or have done prior research. Ticket of Leave Park is marked out on the street between two houses by an anonymous metal gateway and a path in the grass worn through to dirt. The large back fences of some of the houses are the only quibble you could have with an otherwise perfect internal reserve. As you enter the park prepare to be confronted with a majestic stand of Sydney Blue Gums and ready yourself for a transition from the mundane to the sacred, as the pleasant enough monotony of the street front vanishes to reveal a set aside gathering of vegetal elders overlooking the yards of the houses that give form to the space. The circle of dwellings built around a unifying locus speaks to some profound anthropological instinct that is worthy of further reflection. Stand for a while in the lumpy rain or feeble sun and wait for a clarity of mood to be delivered to you by the space. Energised by the first reserve, continue on to Jinkers Green, which is as easy to miss as Ticket of Leave. It’s identifiable by an inconspicuous warning sign and a small diversion in the cement footpath. Perhaps even larger than Ticket of Leave, Jinkers Green features a less heavily treed, lush green lawn and a more varied elevation profile. Adolescent eucalypts stretch their contorted forms near playground equipment and its woodchip cushioning. The lime white branch of one dips down to chest height, affording the perfect surface for those who habitually inscribe the pale flatness with dark ciphers from left to right: Hayley. A seemingly well-preserved patch of wet sclerophyll forest spills out into the open lawn, a remnant of the once dominant vegetation that has been allowed to flourish seemingly as a secret within this already secret space. It’s so thick that it will give you the sense that if you began to explore it further you might vanish into the depths forever. Another more humble example exists in Daceyville. Enter the reserve via a paved path that leads in between two weatherboard fences, pleasingly free from paint, aside from one or two washed out green or pink slats. Visible above the fenceline is a teasingly low-pitched roof, almost horizontal, with bricks painted pink and powder blue. The reserve is nested amid the surrounding houses, ringed by a paved road. It is typically empty, with small amounts of rubbish often piled up at its fringes. A slight wind might stir the congregation of casuarinas at one edge. Stride out into the centre, spinning slowly as you walk to achieve some approximation of a 360 degree view. Versions of internal reserves also exist in many new apartment complexes, such as Raleigh Park in Kensington, which is unique due to its security guard dwelling at the entrance that gives it the feel of a gated community. This example follows a radial design and a curious set of sandstone columns, complete with entablature and a stepped retaining wall, all set on a slightly raised lawn platform encircled by a sandstone border. You can walk through the threshold formed by the columns and follow a set of stairs all the way up to Balfour Rd. 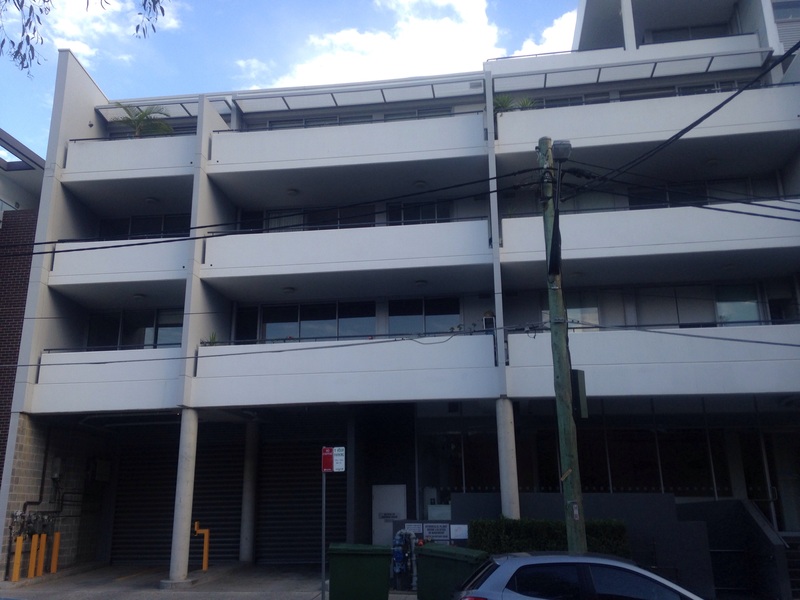 A less flattering example can be found at a nearby, resort style apartment complex, off Dalmany Ave in Rosebery. This compact reserve resembles a sunken garden or pit, bordered by a few trees. Incongruously grand sandstone steps lead down into the reserve, which, due to its peculiar form, might make you wonder whether it was once a dam of some kind. Warning signs depicting bodies flailing above water and text alerting residents to the dangers of the park in heavy rain seem to lend further credence to this idea. Edmund Resch Park is right on the Eastern border of Waterloo near Southern Cross Drive. It’s an oasis of calm sheltered from the busy road by the Moore Park Gardens apartment complex that now exists in the site of the old Resches Brewery. Like the classic internal reserves of Kilara, it is locked off from roads by surrounding buildings and footpaths. The park is often populated by dog owners making use of this rare patch of greenery. The Park has pedestrian access to a footbridge that takes you over Southern Cross Drive, into the parklands and playing fields on the other side of the road. Entire books might be devoted to the internal reserves of Castlecrag, which was planned by the architectural team that designed the nation’s capital, Walter Burley Griffin and Marion Mahony Griffin. Unlike the above examples, here the entire suburb is structured around a series of interlocking internal reserves, allowing you to traverse it as though on the backstage of a theatre set. A walkway wends its way along the steepish slope, between backyards and sizable chunks of regenerated and remnant native bushland, occasionally opening out into landscaped areas where the wet sandstone shows through the trees and rustic steps are cut into the ground or formed of deliberately placed chunks of rock. At the highest point in the suburb you will find another reserve that features two tennis courts in its centre. Here you might use the tap that forms part of the steel piping in the tennis court fence to refill your water bottles. Sometimes you find buildings that are the seeds for the dominant building type that would come to define a particular area, perhaps even a particular era. This fellow is one such. Whether the causal links are there or not (i.e. whether or not it was an influence on other buildings) interests me less than the idea of this building existing as a fine example or paradigm that sits in relation to a wide range of other examples and makes sense of them stylistically. It enables you to tell what other people where trying to do. 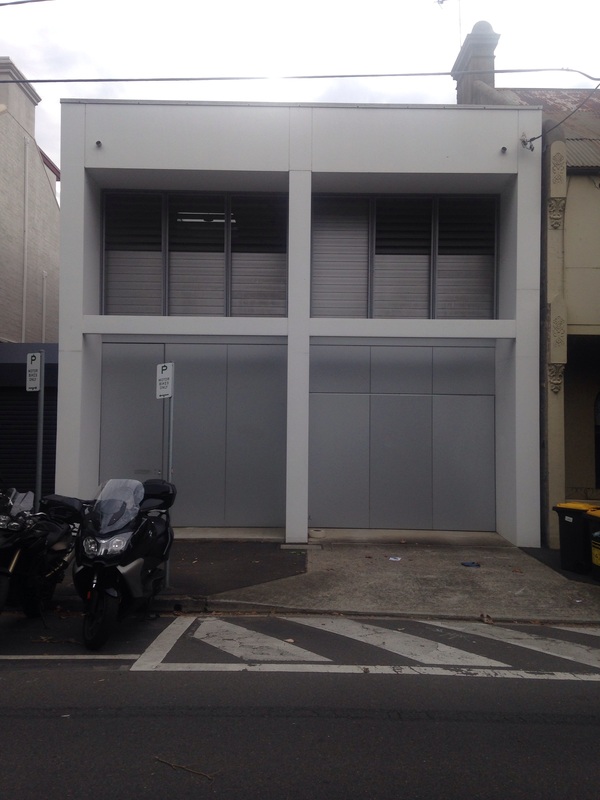 Its an inconspicuous two story, minimalist terrace on George Street in Redfern, designed by Ian Moore and Tina Engelen. It’s described as an “outstanding minimalist house” in Bill MacMahon’s The Architecture of East Australia (89). As you look around (up in particular) the new building developments that characterise the Waterloo and Zetland area you can see this style everywhere. Often with needless additions, such as coloured feature walls (once limited to interiors, feature walls now turn up on the sides on entire buildings), lazer cut cladding (the exemplary new featurist feature) or jutting extensions of cheaply put together brick or cement. Not far away is Strickland House, which is a paradigm for the area in terms of format, representing the shift from residential terraces to apartment living. The German philosopher of design, Peter Sloterdijk, names the apartment as the key building type of the contemporary human being, allowing for disconnected connectivity or coisolated living: “The stacking of cells in an apartment block, for instance, no longer generates the classical world/house entity but an architectural foam, a multi-chambered system made up of relatively stabilized personal worlds” (2009). The apartment format, combined the minimalist style, combined again with cheap, colourful flourishes, gives you the prototypical, new building of this area. Perhaps these flourishes are no different to the flourishes of pebble dash or stucco of arts and crafts dwellings, which I tend to react to in a more favourable fashion.